bird feeder closeup, originally uploaded by espeedy123. Yesterday I put up this bird feeder my Dad gave me. It’s situated right outside the house in clear view from the kitchen table, so I am expecting a good show. Coming up on 24 hours, and no takers yet. 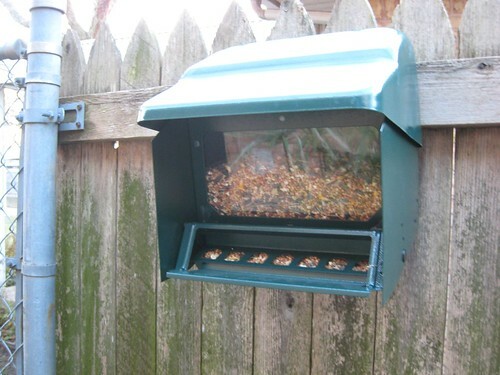 If you have a feeder, I’m interested to know how long it took your birds to arrive, and if there are any special techniques you suggest for getting them to show up sooner. I am an impatient bird watcher!! 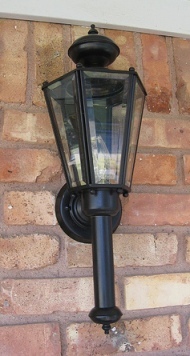 Porch lamp before and after. Isn’t spray paint great?! I could kick myself for not having taken a better before photo, but you get the idea. 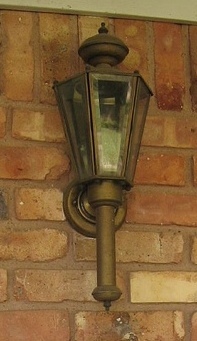 The porch lights on either side of my door were dingy brass. I removed them, cleaned them up, and spray painted them in a black semigloss finish. They look a lot better now — the difference is more dramatic than the photos show. And all for a $3 can of paint. There is a house across the street from me with similar fixtures in white that just scream for a new look. Do you have something you’ve spray painted that looks a lot better now? Please comment! Is worm poop the new Texas Tea? 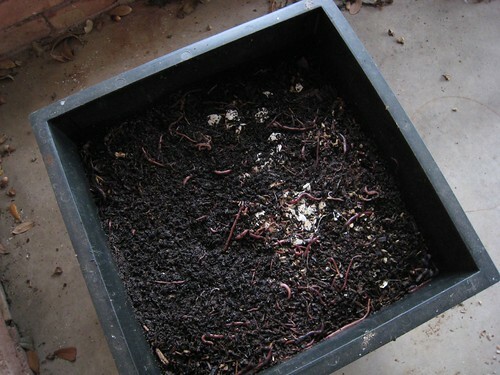 Worms posing (and composting!) for the camera, originally uploaded by espeedy123. Szaky’s company Terracycle is apparently making a fortune. 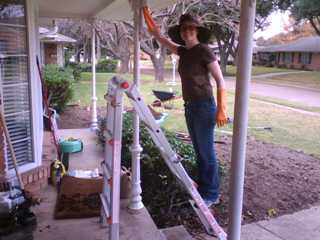 Yes, that’s me on a Little Giant ladder. Note how one side is shorter, enabling a closer perch over the porch. I needed the extra few inches to avoid damaging the shrubs while I reach to clean up the porch posts, before painting them. My father-in-law offered it to us when we needed an extension ladder, and I wondered if I’d ever get to take advantage of its many freaky infomercial features. 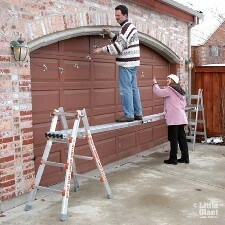 I can check the “ladder-on-stairs” box. Perhaps I can do a scaffold next. Baker sofa from Craigslist, originally uploaded by espeedy123. OK so maybe that’s a bit of an exaggeration. There is no doubt, however, that there are great deals to be had on the Craigslist “furniture for sale” ads. Today’s steal is this Baker camelback sofa I snagged for $150. Is this great or what?!?!?! The woman selling it got it from a mom’s friend, so she had no qualms about letting it go for a tiny fraction of its original cost. It doesn’t look so great situated here in the entry but alas, the old sofa has to go somewhere first. And yes, it came with the cushion which is sitting somewhere off camera. Here’s a similar sofa on the Baker website that STARTS at $7,100. 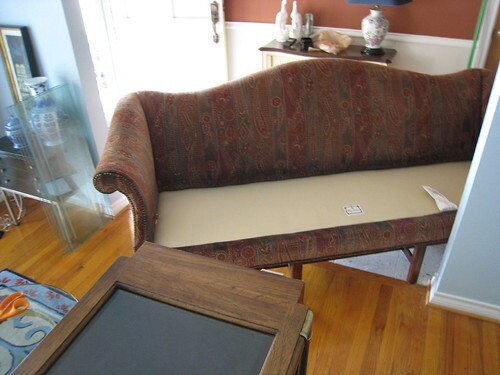 If you have a great furniture piece from Craigslist please post a comment with a link to the photo so we can all share the great furniture vibes! Paint tips, originally uploaded by espeedy123. Painting is one of the most cost-efficient and novice-friendly DIY projects. I have a laundry list of things I want to paint, and I’ve built up a good collection of supplies like dropcloths, paint tins, and scrapers. Unfortunately I seem to never have enough brushes. Mine tend to die a slow death wrapped in plastic in the refrigerator. That’s how I store them, especially the ones with oil paint on them, thinking that I’ll pull them out the next day to get going soon enough for them to not dry out. Instead, I tend to get distracted by other projects and arrive back at the brushes when it’s too late. It’s an expensive bummer to go buy another one at Home Depot but I kept doing it. But now I’ve discovered the lazy painter’s way to clean and restore brushes. Drill a hole at the base of the brush handle. 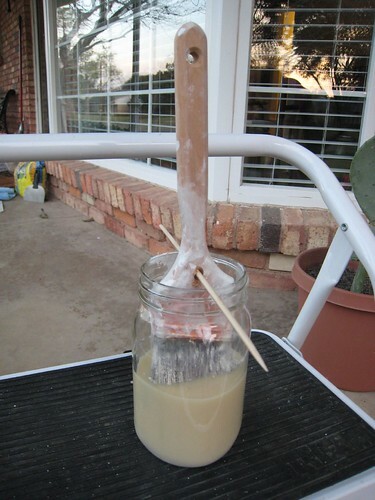 Fill a glass jar partway with brush cleaner. Use a pencil or a bamboo skewer to suspend the bristles in the cleaner, making sure that only the bristles are submerged. It seemed too simple to be true that this would work so well, but thus far it really has worked out nicely. Apparently it’s the pressure on the bristles and not the chemicals that make it so hard to get one back in shape. I’d love to hear other painting shortcuts if you know them!